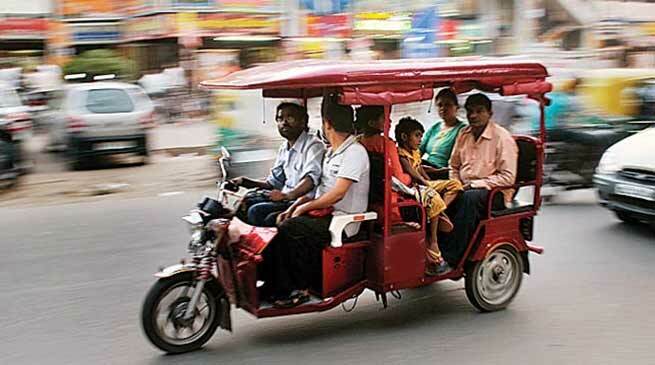 The Hailakandi district administration of Assam has asked the transport authorities to bring all the e-rickshaws under the ambit of registration. Deputy Commissioner, Adil Khan directed District Transport Officer to hasten the process of registering all the e-rickshaws plying without registration numbers and to define the specific routes outside the municipal areas to streamline the flow of traffic in the town. The DTO informed that some routes have been almost finalised in consultation with the traffic authorities to keep the e-rickshaws out of bounds of municipal areas. More than 2,000 battery operated rickshaws mostly of Chinese made are plying without registration numbers in Hailakandi town. The Deputy Commissioner also asked the DTO to ensure that no dealers sell any vehicle without route permit. These decisions were taken at the District Development Committee (DDC) meeting held at Deputy Commissioner’s conference hall here on Saturday. Meanwhile, 170 e-rickshaws have been registered by the transport authorities here. The Deputy Commissioner asked the head of the Fisheries department to strictly enforce the ban on catching of fish using mosquito nets during the breeding season. Directing the fisheries to go in for surprise inspection around the wetlands and other water bodies, Khan said those caught fishing must be brought to book. Following the Deputy Commissioner’s directive, the personnel of the Fisheries department have swung into action to enforce the ban. Khan also instructed the head of the Labour and Employment department to ensure that no cash is paid to the tea garden labourers as it is strictly prohibited by law. “The Labour department has to ensure that no cash payment takes place and that wages are deposited directly into the bank accounts of plantation workers,” he added. The Deputy Commissioner reviewed the anti-erosion and flood protection works and directed the superintending engineer of Water Resources department to ensure no breaches take place in the embankments particularly in vulnerable and flood prone areas.The superintending engineer assured that no breaches will take place following the augmentation of the embankments. Khan asked the official to ensure quality flood protection work in the ongoing projects under FMP and SDRF. Of the five projects, two have been completed. Expressing his ire over the inordinate delay in execution of works by the Irrigation department, Khan said that he would personally inspect the sites to see the status of progress. The Deputy Commissioner asked the official of the Public Health Engineering department to complete the process of uploading of data for declaring officially Hailakandi as an Open Defecation Free (ODF) district. As per Baseline Survey 2012, 84, 614 Individual Household Latrines (IHHLs) have been built registering 99.88%. Expressing serious concern over the non-functioning of over 250 users’ committees constituted for running water supply schemes, Khan said that he would look into it and explore ways for revival of the defunct schemes. Khan also reviewed the status of progress of projects under State Roads, PWD (Rural Roads) and NH and asked the officials to expedite the remaining works. He asked them to keep the roads motorable to lessen the hardships of the commuters. Khan asked the NH to expedite the construction of the remaining work from Dholeswari to Janeki Bazaar. The Deputy Commissioner asked the officials of the roads constructing agencies to submit a comprehensive action plan for new projects in the district before the meeting in Dispur on June 1. Khan urged the district heads to cooperate fully with the upcoming Measles Rubella vaccination campaign beginning June 11 for children in the age group of 9 and 15 years and Ayushman Bharat (Urban) programme that provides Rs 5 lakh to each family annually who falls under the Socio-economic Caste Census, 2011. The Joint Director, Health Services, also appealed to one and all to extend support in making the upcoming programmes a success. Following pleas by some district heads, it was decided to hold the DDC meeting on the 6th of every month so that every development department can submit the details of status of progress reports accordingly. The next DDC meeting will be held on July 6. DDC, FR Laskar, ADC, Ruth Lienthang and senior officials were present in the meeting.